Fulfilling a life-long dream since emigrating from Puebla, Mexico to the United States in 1992, Maria Meza opened El Rancho Grande in Providence, RI, with her son, Joaquin Meza Jr., on May 5, 2007. Both are committed to offering traditional Mexican dishes at an affordable price using only the most authentic ingredients possible, often bringing in hard-to-find food products directly from Mexico. Special festive events spotlighting traditional arts and entertainment from Mexico are held throughout the year. We have a small but well curated bar, we have a select choice of the most reputable, responsibly made Tequilas and Mezcales to complement our cuisine. Along with a creative craft cocktail menu that changes with the seasons. All staff speaks English and Spanish. Puebla’s food culture, known as Cocina Poblana, is popular all over Mexico. Puebla is considered the home of mole, a rich, spicy sauce containing chocolate, cinnamon and nuts, as well as different types of hot peppers. 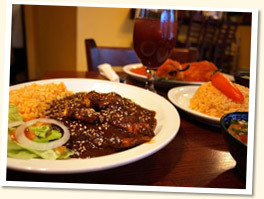 Served with chicken, mole has become the most renowned dish of Puebla’s cuisine.